I must admit, I at first was not so excited to go. It was an excuse to go out and do something instead of sitting at home that evening. And, the tickets were free too, so that was a motivator as well. Driving down to the Royal George Theater on Halsted was a great adventure, listening to Romy's mom comment about EVERYTHING she possibly could. The car ride was filled with her voice commenting about the neat old bridges, the fire escapes, and an old tennis club she once belonged to. . . there? "Ha ha, I told you so! You should of taken me!" as it passed overhead. Remeniscent of the snowy blizzard day when I begged Romy to drive me to the egg place! Woah, bad idea! So we finally got there, about 15 minutes before it started, sat down in the balcony, and watched the show. It was unlike any other show I had ever seen. 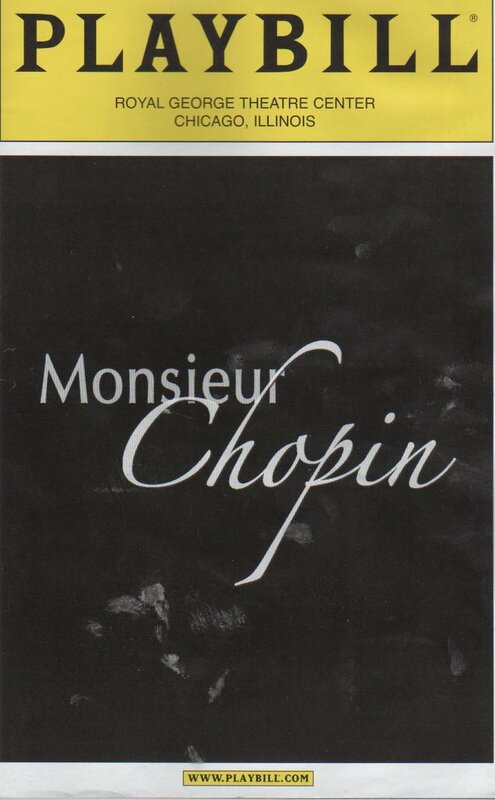 There was only one actor, Hershey Felder as Frederick Chopin. The audience, we were his student, and he was giving his lesson, and life story, in his salon, 9 Square d'Orleans, Paris. It was March 4th, 1848, in the afternoon. Somehow I got sucked in, listening to his life story, bits and peices between his music, in chronological order, the first peice being one he composed when he was only 7 years old! He went through his life in Poland, then his "escape" to Paris, France. There he played in the salons of the rich and famous, etc. But what made it so interesting to me, was that it was told as if Chopin himself was telling his own story. 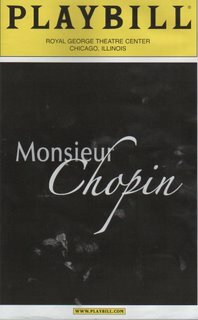 When it was over, Chopin brought us up to date to March 4th, 1848, and told us that a year later, he would die of the disease that was ailing him his whole life, consumption. And then, once Chopin was dead, the actor turned into a narrator, and told us further about Chopin's life, how he had bipolar disorder, and that it is evident in every peice of his music, ups and downs, like he was in real life. When you find that out, it was kind of freaky, because then you realize at some points of the story line, you remember how he was a little psycho. Then you have an, "Ohhhhh. . . " moment. But it didn't end in a depressing way at all. Me and Romy made up a song, "At the end the end of the roll. . . . My colon will blow. . . ." Hehehehehe!! !